For Vito’s review of the theatrical cut, click here. Recently, Walt Hickey over at FiveThirtyEight, published an article entitled, “Ghostbusters is A Perfect Example of How Internet Movie Ratings Are Broken.” It was his conclusion I found most discouraging and the title of the article. While I agree with his point that online reviews and review aggregators are “inconsistent, easily manipulated and probably not worth half the stock we put in them,” it is not the rating system that is broken but ourselves. We don’t view film as an art-form (or any art for that matter): Instead, it serves as a way to confirm our own conception of reality and allows us to bask in the glory of our own confirmation bias. That problem doesn’t seem to be going away any time soon, unfortunately, but last night, I was reminded of how much we’re all missing out on when willfully ignore the artistry of film because it doesn’t conform to our own impositions. Upon this second viewing, I was able notice something much neglected in the many reviews I have read in the past and recently, and something I must admit I missed myself in my first viewing. The themes of rage/impotence, fathers/sons are both still there, but two much bigger ones emerged: dreams (particularly of one’s father) and gods/men. These two nicely tie into the two former themes much more than I originally recognized. For one, the occurrence and reoccurrence of dreams seems to be ever-present. The opening sequence, where Bruce’s parents die and he falls into the cave lifted up by the bats, is a dream. Bruce visiting his parents’s graves is a dream. The “Knightmare” sequence in the desert is a dream—as is the dream within that dream. Clark’s meeting with his father on the mountain is a dream. The same might be said about Lex’s quest to rid the world of Superman. This is one of those things that I just failed to put together the first time around, and it works in tandem with the fathers/sons theme heavily featured throughout the film. There is also major fleshing out of Kahina Ziri storyline, who only had a brief scene with Senator Finch early on. Ziri acts as the catalyst for Clark, through a television report on the Senate hearing, to begin his investigation of Batman. Clark uses his press credentials to investigate her, then later Cesar Santos, the man with the bat-brand over his collarbone. These scenes allow for Clark to work out his crisis of conscience and ultimately serve as the reason that he dismantles the batmobile in the first place. Moments of doubt like these bring more life to Superman and are particularly instructive of its god/men theme, for it heightens the humanism behind Snyder’s perceived misanthropy. In the case of Lex Luthor, he can’t accept that “God exists,” because to his mind god is a contradiction. If God is all powerful, as Luthor puts it, then he cannot be all good; if God is all good, then he cannot be all power. His goal has a perverted logic to it, but should we take turn for the twisted, we might just join him. What Luthor can’t accept is that Superman acts unilaterally, that he is truly benevolent. And this kind of thinking infects Bruce Wayne as well, who sees Superman as a threat to humanity, even denying Superman the classification of a man during their big brawl, stating, “You were never a god. You weren’t even a man.” Most telling is when Terrio, the screenwriter, cribs from The Dark Knight Returns almost verbatim: “I bet your parents taught you that you mean something; that you're here for a reason. My parents taught me a different lesson, dying in a gutter for no reason at all. They showed me that the world only makes sense when you force it to.” But as the much bemoaned “save Martha” line demonstrates, it serves as Batman’s epiphany, a moment of recognition, that Superman is a man—something that Bruce Wayne, after twenty years in Gotham has forgotten. This hard edged Batman hopes, like Lex Luthor does, that “if [he] keeps everything the same, maybe [his father will] come back.” But to force the world to stay the same is Batman’s (Luthor’s) tragic flaw, and as a result, it caused Batman to become judge, jury, and executioner—a man for whom the law does not apply but enforces it like a god himself. Ironically, it during the promised title fight that on a column appears, “Quis custodiet ipsos custodes,” a quote from Juenval, which means, “Who watches the watchmen?” That question, it would seem, is the central guiding purpose of the film, one which was heavily buried in the theatrical release. Even General Amajagh, the African Warlord from the beginning of the film, claims that no one can be neutral. And that is certainly true for Superman, since his attachment to humanity—and the world—will always be through his one true love, Lois Lane. Furthermore, in my second viewing, I was reminded of just talented Zack Snyder really is. The film is full of references, from using some of the lyrics of “Everytime We Say Goodbye” as dialogue in an ironic twist to an allusion to Gustave Dore's The Fall of the Rebel Angels. Not to mention, even scenes that I would have cut, like the police officers watching the Gotham v. Metropolis football game, still serve to foreshadow the title bout at the film’s center. He’s a lot smarter than I think most people give him credit for. He understands textual unity, how to convey a theme, and is even willing to experiment with form and structure (to various degrees of success). He’s a highly ambitious filmmaker who genuinely seems to be interested in making movies. This isn’t to say the film is perfect. By no means is everything fixed with this extended cut: The film still has two third acts, some pacing issues, and suffers from the needless insertion of Wonder Woman (whose musical motif is amazing by the way). But frankly, these are no bigger problems than your standard cookie-cutter Marvel film either. However, Batman v. Superman: Dawn of Justice—and I can’t stress this enough—has actual vision: It’s unique and bold in an time when most films are derivative and timid. The uncut version of the film is superior in a lot of ways, and it highlights how, really, this movie could have very easily been a great film instead of just a very good one. Now, of course, the question is how long will it take for everyone else to stop fighting to realize this? 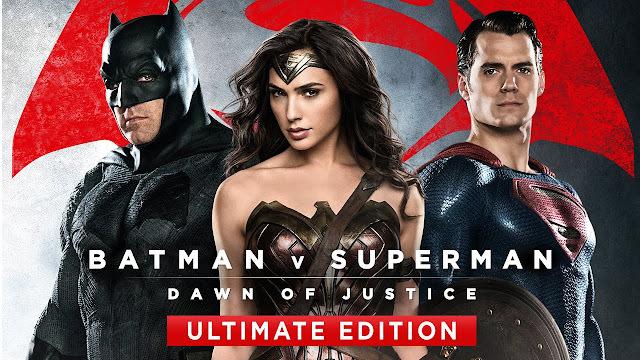 Batman v. Superman: Dawn of Justice: Ultimate Edition is currently available on Blu-Ray, DVD, and digital download. Lex first said that line with the “the oldest lie in America” thing. He is anti-God and believed that “If God is all powerful, he could not be all good. If God is all good, he could not be all powerful.” He framed, demonized Superman and even pitted Batman against him just to prove the said idea. In addition, in the following, I will let the movie speak for itself on how the lines are interconnected to deliver the theme. “Men are STILL GOOD. We fight, we kill, we betray one another, but we can rebuild. We can do better. We will. We have to. Isn't it amazing what happens when you pay attention to a movie? I was thinking of most of those lines while I wrote the review actually. However, because of my deadline I couldn't give the ultimate edition the same depth I had given the film in my original review. And thanks for commenting.